Knowledge Is Power! The Cost of Knowing (About Barter) Is Nothing Compared To The Cost Of Not Knowing! In your business you know that knowledge is power. When it comes time to use barter-a powerful business tool-use it most effectively by consulting with one of the most knowledgeable guys in the world on this specialized subject. Strategize with Bob Meyer to improve your company's bottom-line. Together you will identify the optimal solution for your company's situation, and set-up a step-by-step plan for the attainment of your goals. 7) And, most importantly, structure the best deal for your company. if that's the direction you desire. He's provided consultation services to entrepreneurs and Fortune 500 companies, both here and abroad. His advice was sought by the nation's biggest defense contractor before bartering $16 million inventory. A prominent Japanese corporation flew two company executives to California before its joint venture with a corporate barter company. One of nation's largest media companies paid Meyer for his advice. He was also a strategic advisor to venture capitalists. He's twice addressed the American Countertrade Association, a prestigious organization of major Fortune 500 corporations that "countertrade" in the billions. Additionally, you will benefit from Meyer's expertise on the latest accounting and tax information, plus valuable marketing and advertising assistance. Take advantage of the wealth of experience offered by this barter industry veteran, and your bottom-line profits will surely grow. For those who need to ask an expert specific questions to get started or over a roadblock, Bob Meyer will be available for a very limited amount of telephone consulting. Our normal consulting fees are $200 per hour. But in order to be accessible to small businesses we offer 15 minutes of oral telephone consulting for only $75--no exceptions or minimums. Providing more than one hour of telephone consulting. Written reports of any kind. E-mail your fax number to us at bmeyer@barternews.com so we can determine the best time for your oral consultation…we will fax you a form for your convenience. 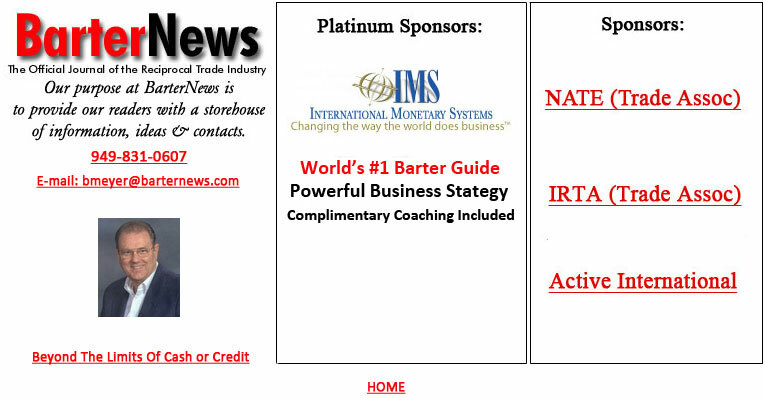 BarterNews is published quarterly by BarterNews 2007©. All rights reserved. Reproduction in any manner, in whole or in part, needs specific written permission of the publisher.